A life in the movies has been an American dream for a century. Many people dream of becoming Hollywood professionals, but either aim too high (by trying to produce their own feature film) or too low (by hanging around restaurants frequented by movie stars) and end up frustrated. Wouldn't it be great if someone who knew what to do, someone who had achieved acclaim in the field, would walk us through the steps to success? At last, here is a book by a seasoned movie and television professional, Emmy winner Sandra Gordon, that is filled with practical, yet highly effective ways to build a career in entertainment industry. Sub-titled Establishing Your Career in Film and Television Production Gordon calls upon her own experience working on the television series Party of Five, the movie Rudy and many more. There are many books that teach job-seekers how to write resumes or ace interviews, but not many books like Action! Uniquely designed for individuals who are interested in a career in the entertainment industry, whether they are recent college graduates or middle-aged career changers, Action! takes the formula out of the job-hunting book to the next step, telling its readers not only how to write their resumes, but where to send them, how to keep their jobs once they are hired, and how to advance in their career. 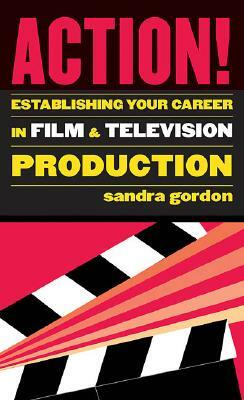 Sandra Gordon is an Emmy winning actress and the author of Action!